We are starting to get more and more questions about this topic in our clinic – probably due to the numerous ENT surgeons and family practice doctors in the community that are prescribing and advertising “allergy drops”. Allergy drops (or more appropriately sublingual immunotherapy – SLIT) are mixtures of allergens that are placed under the tongue for treatment of symptoms related to environmental allergies. SLIT has been used for years in Europe and is becoming more popular in the United States, particularly with primary care physicians and ENT surgeons. There are also two FDA approved sublingual products – Grasstek and Ragwitek, both manufactured by Merck. These two products have not been extensively used in our area. 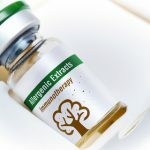 Allergy shots (or subcutaneous immunotherapy – SCIT) have been and continue to be the most popular form of allergy treatment in the United States. Allergy shots involve the administration of specified amounts of allergens in a small shot under the skin. These are typically administered once weekly for a specified period (usually about a year) and then spaced out to every 2‐4 weeks. So from this, the biggest advantage of allergy drops is the convenience factor. There are three big disadvantages of drops: 1) there is no published data that gives a dose range and schedule for each allergen, 2) there is no data that suggests that lifelong tolerance ever develops from allergy drops (i.e. you may be on them for the rest of your life), and 3) current studies do not suggest that they are effective in patients allergic to more than one allergen (90+% of our allergic patients have >1 allergen sensitivity). Allergy drops are typically made using the same FDA approved allergen extracts used to make allergy shots. However while these extracts are FDA approved for injection under the skin, they are not approved for oral use. The major problem with this is that a non‐FDA approved product will not be paid for by insurance. Though allergy drops are typically cheaper than allergy shots, many insurances will pay some or all of the cost for allergy shots. In conclusion, with the research we now have, it appears that allergy shots are, on the whole, the better choice for most people. The potential for development of lifelong tolerance after 4‐5 years is an exciting prospect that we have not seen with allergy drops. So essentially, we are weighing convenience versus potential for permanent cure. We here at HAAC do have some patients on allergy drops and we feel that they may be the right choice for certain patients. As a whole, however, most of our patients opt for allergy shots for the reasons listed above. Come in for an appointment and let us go over the benefits and disadvantages of each!